My Weedeater Featherlite is frequently losing power. I have checked the power plug. Everything sounds good. What else should I check to make it work? My five years old Weedeater Featherlite SST25 cranks & idles quite well, however it dies immediately once the throttle is open particularly when I open it rapidly. New fuel lines, plug, gas, primer bulb, carburetor remodeled, muffler not blocked. I am confused what to do? I guess the main culprit is a blocked or dirty carburetor because it always causes an irregular flow of fuel & loss of power. Moreover, at full choke, your Weedeater might not get the required fuel in order to work appropriately. I would suggest cleaning the carburetor. I hope that it will solve your problem. I want to share my problem here to get a quick help. When I start my Weedeater Featherlite, it idles up too high. I can see the air bubbles in fuel lines and primer bulb. Sometimes, the Weedeater does not take gas whenever I squeeze the choke. I would like to share that I have replaced the fuel lines and primer bulb recently. What should I do now? Hi Tom, do not worry, as it is very common to have a small amount of the air in the Weedeater’s primer bulb. I would advise checking for the possible leaks of air in the Weedeater because it will make the Weedeater idle higher than average if Weedeater is pulling air from somewhere else. Do call a professional mechanic if the problem persists. Guys, please tell me how I can unflood my Weedeater Featherlite in a right way. I am trying to clear all the excess fuel from the Weedeater Featherlite. Still, need your suggestions in order to do it properly. Set the flooded Featherlite Weedeater on an even surface with no hindrances close to cutting head. Let the engine to cool down slightly. Hold a spark socket cap & try pulling it directly off a spark plug. Now, place a flexible wrench on a spark plug while turning the spark plug left to right in order to loosen it. Once you clear the Carb’s combustion section from extra fuel, it will shot out of a spark plug opening. Now, wipe out the excess fuel, oil, and debris from a spark plug. Carefully, insert the plug & turn it left to right until tight properly with a flexible wrench. Lastly, hold a throttle trigger while pulling the starter rope in order to start your Weedeater. 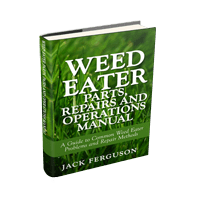 Try to inspect the above-mentioned important parts of the Weedeater. If you notice a blockage or some, other issues in these parts. Do call a professional mechanic to fix them. My one-year-old Weedeater Featherlite bogged down whenever I use it and as a result, it stopped working well. I have not faced this issue before that is why I am quite worried. Your suggestions will be highly appreciated. Well, it is better to service the Weedeater regularly in order to enhance its performance and efficiency. My Weedeater Featherlite is not working properly as it is stalling badly on full choke. What should I do? The Weedeater Featherlite is just three years old. Should I buy a new one? The choke on any Weedeater is specially designed for cold starting the engine. 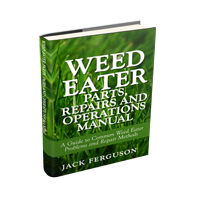 Well, if users leave a choke on, their Weedeater will not run properly when they try to start its engine. Excessive usage of the choke can easily overflow the engine. When it happens, users have to wait for several minutes in order to let the oil to drain out. The recommended way of starting the Weedeater’s engine is to set a choke properly to an on position & pull a starter cord for approximately six times. I hope that it will work for you. My Weedeater Featherlite FL1500 head starts to spin rigorously as soon as I start the engine. I do not know why it is doing so. I have tried to fix it but all in vain. Has someone faced this issue? If yes then please share some tested solutions. The main reason behind this problem is worn out springs of a clutch. The Weedeater head can be damaged easily. Well, it fails due to various wear-related issues. When the clutch fails, the Weedeater’s does not spin at all or it spins intermittently. When you see that springs are badly –out, you might be capable of getting the Weedeater working by simply replacing them. On some models, removing a clutch directly from a crank tube is an easy task as you just have to remove 1 or 2 screws. Nowadays, you can get the replacement clutches easily. My one-year-old Weedeater Featherlite FL20 is showing the signs of sputtering, stalling and power loss whenever I use it. What is the reason behind it? Is something serious? Share your views and suggestions, please. All these signs indicate that the Weedeater’s carburetor needs adjustment. It is an important part of the Weedeater’s as air and fuel mixes here before it catches fire for ignition by a spark plug. When you notice that carb is not maintaining the correct air and fuel mixture to keep enough engine speed that the performance of your trimmer will surely suffer. Usually, the makers preset the carburetor during production; however, you are allowed to make minor adjustments to its idle speed for decreasing or increasing the speed of an engine. Blockages in the pipes & jet choked in a carburetor. Another reason is a lack of compression in Weedeater’s cylinder. Do check these things hopefully; your Weedeater will start working again.